Here’s some quick bite-sized news on whats new in town and on the shelves. You might have noticed this counter pop up at MidValley Megamall in the last month. 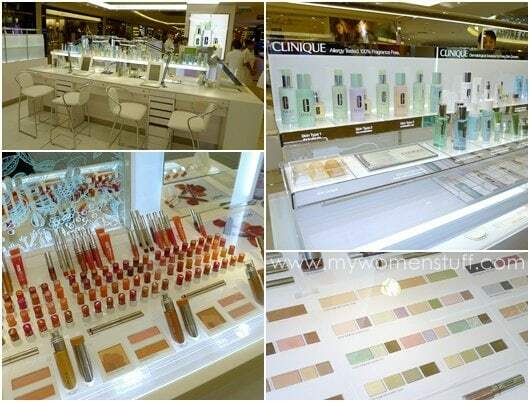 Its a new concept in cosmetic shopping, where Clinique has opted to bring the counter to you so you can “Shop As You Like It” (SAYLI). 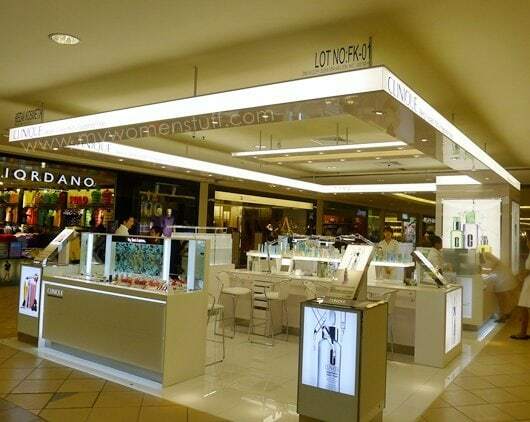 At this open counter, you are welcome to browse the makeup and skincare unhindered by sales assistants , but if you need help, the SAs are there to help. I find it easier to browse colour makeup by myself, but I do prefer some assistance with skincare so this concept counter strikes a good balance. I stopped by to pick up some items, and for once, I was not being tailed everywhere by the inquisitive SA, making unwelcome suggestions as to what I should or should not get. When I asked her opinion, she was helpful. Otherwise, her presence was unobtrusive. I think that was instrumental in my actually spending money there (to get a really nice gift with purchase ;)). I also noticed that in the 20 minutes I was there, at least 4 women stopped by, browsed, asked a few questions and left with purchases. I guess the concept does work! I was invited to take a look at the MAC Quite Cute collection and was an hour late due to torrential rain and awful Friday traffic. Quite Cute is a collection of mostly pale pastel hues and bright pinks. A cursory glance told me nothing interested me. I was right, until the SA offered to try a blush on me, and she used Giggly, a pink mineralized blush with a sparkly purple heart embedded in the middle. MAC Quite Cute collection is limited edition and is available at all MAC stores and counters. 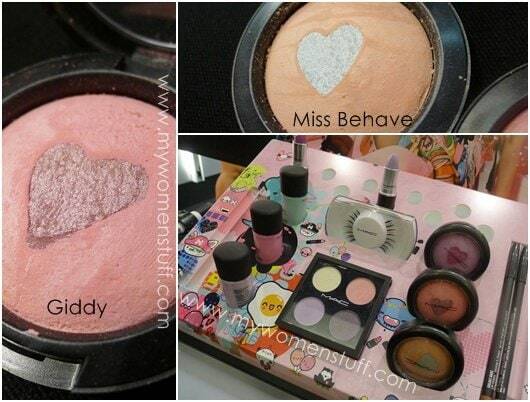 No prices but the Mineralize blushes are RM100. Kiehl’s x Pharrell Williams Eco-Tote is complimentary with the exchange of 12 Kiehl’s empties (full size) and is available from April 2011 until further notice. Garnier Mineral Deodorant comes in 2 sizes (20ml and 50ml) and 4 different types and retails at RM3.90-RM7.90 each. Vichy has improved on their Normaderm Anti-Imperfection Hydrating Care moisturizer by incorporating in it, dermatological peeling ingredients using Salicylic Acid (loosens dead skin cells that cause clogged pores and anti-inflammatory), Glycolic Acid (exfoliation and cell renewal from deep within the skin) and Lipo Hydroxy Acid (gentle exfoliating agent that optimizes cell renewal). It also contains Silica controlling sebum and Thermal Spa Water and Glycerin for continuous hydration. 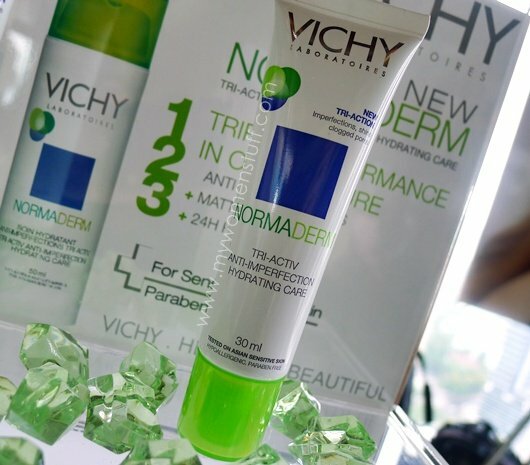 Vichy Normaderm Tri-Activ Anti-Imperfection Hydrating Care retails at RM49/30ml and RM79/50ml and will be available from May 2011. Whew! Was that a lot to take in? Felt like a lot to me 😛 Still, I’m sure there’s something in there to suit each of you and MAC is I’m sure one of it 😀 So tell me – are you planning to check out the MAC Quite Cute collection or have you picked up items from that collection already? PREVIOUS POST: TheBalm Stainiac Beauty Queen is a very pretty Hint of Tint! I’m on a MAC ban 😛 I checked out the collection but didn’t buy anything. I can’t deny the blushes are so cute with the little heart in the middle. I wish there was more shop as you like service out there. I hate it when SA’s stare at me when I’m browsing through makeup! Going to have a long look at Quite Cute when it realises here as I sort of need a new blush. I like the idea of the Clinique counter, often I want to get things straight in my own mind before I ask anyone else! The blushes in Quite Cute are really quite cute LOL! But they are a bit dusty to me. Do check them out when they get there – Giggly is a cute pink! Hi Paris! Pharrell Williams is a singer, producer and member of the N.E.R.D. As a group, they integrate music from different genres more successfully than others (rock, hip hop, tribal, dance etc). They’re not that mainstream but they have garnered some mainstream success. They’ve collaborated with a broad range of artists, from Snoop Dogg to Britney Spears. Pharrell also happens to be hot (lol!). i’ve been using the garnie deodorant for like a few year now and it’s the best i’ve ever use, i dont sweat alot but when i do (during hot day) it does what it should do and the scent is just so fresh!!!!!! I might give the Vichy moisturiser a go as I’m getting seriously bored of using the whole Obagi and Dermalogica acne range which I have been using since I was 18. As much as I am thankful to them for getting rid of all my acne, now I want something to lighten it. I have been using some products (mainly Clinique Repairwear Laser Focus and DiorSnow White Reveal Essence) to lighten post-acne spots on my skin but nothing seems to work. 🙁 Any good suggestions Paris? The SAYLI concept does sound really good! Some people (ie. me :x) tend to get super-self-conscious when the salespeople trail them everywhere. Don’t get me wrong – the advice they give is probably sound, but gosh, it kind of pressures you to buy something. 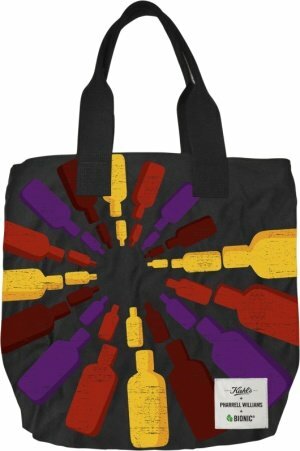 I almost always leave without looking at the items properly and avoiding the store in the future. Its not just you Esther. I feel the exact same way! I always feel unduly pressured and sometimes, irritated when they offer products I’m not interested in so many times, they lose a sale instead of making one. And yes, I do feel that some stores think we want to steal from them! If that Garnier deodorant is the same as what I’m using, then I’d have to say no, I don’t really like it. Aiyee! I guess it doesn’t work for everyone.